Solar Water Heaters – Quantum Renewable Energy Inc. Solar water heaters are the most cost effective use of solar energy. They utilize simple reliable technology to capture the heat of the sun for use in domestic hot water or space heating. Solar domestic hot water will typically save between 50% and 70% of a home’s annual water heating expense depending on the fuel type being used in the home’s current hot water heater. Solar collector: Can be either a flat plate collector or evacuated tubes, depending on what your heating needs are. Glycol: Food grade propylene glycol and water solution. This solution is non toxic and protects the system from freezing down to -40°C. Heat exchange module: The box that contains the pump, heat exchanger, pressure relief valve, and automated system controls. Solar storage tank: A standard 60 gallon electric hot water tank, except that due to its insulated design, it is heated by the sun, instead of electricity. Conventional tank: Whatever type of hot water heater you currently use. This supplies backup heat for times when there isn’t enough heat from the sun. 1. The solar collector captures heat from the sun. 2. The glycol—which is being pumped through the system—heats up as it travels through the collectors. 3. 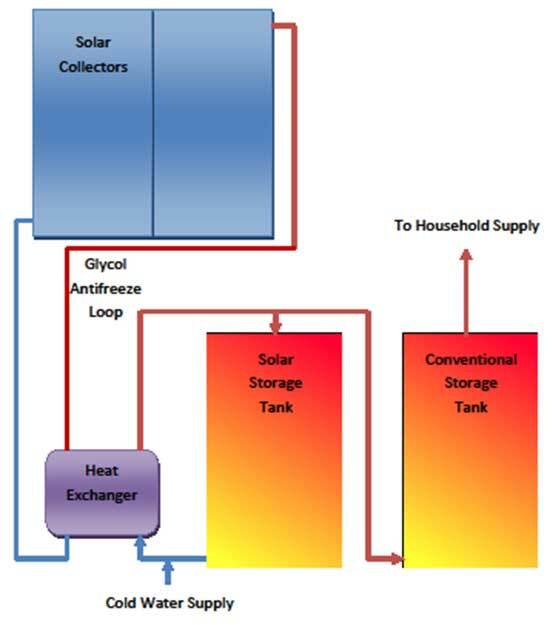 The glycol continues on its loop into the heat exchange module located in your basement and transfers the heat it absorbed from the solar collector to the module. 4. The heat exchange module sends the heat into the solar storage tank. 5. Now instead of drawing cold water into your conventional hot water tank you are filling it with solar heated water. How long does a solar water heater last? The standard lifetime of a system is 25 years; however, a properly maintained system can easily surpass this. How much does installing a solar water heater cost? The average four person family would require a two panel system, for which the installed costs starts at $5500. Please visit our Site Evaluation page if you would like a firm quote. What are the maintenance requirements for my solar water heater? Solar hot water systems require very little maintenance. A glycol pH test every three years should be performed. The service call to perform this test only costs $75. Typical residential system takes one to two days, with only a few minutes interruption in your hot water supply. All of our systems carry a complete two year warranty on labour. Equipment warranties vary from supplier to supplier, typically five years. Will I run out of hot water if the sun doesn’t shine? No. The solar hot water heater reduces the amount of fuel your conventional tank uses, so you will never have cold water in your conventional tank. Is Canada too cold for solar water heating to be practical? Solar domestic water heaters have been installed in Canada since the early 1980s. They have performed well and continue to perform well in the Canadian climate. How much will making the decision to install solar water heaters save me? Solar hot water will supply roughly 60% of your household’s annual domestic hot water heating requirement. The typical four person household can save approximately $250 -400 per year depending on the type of hot water tank you currently own. How reliable are solar water heaters? This particular type of technology is 20 to 25 years old, proven, safe, and reliable. Maintenance involves as little as an annual inspection to monitor the glycol and ensure the system is running smoothly.